It’s fast approaching the time of year when it’s time to start to thinking about storing the surplus tomatoes ready for use over the winter. We grow quite a few tomatoes in the polytunnel each year and always have a few tomatoes left over which we either cook and store in tubs in the freezer, frozen as whole tomatoes for soups, or processing into home made tomato chutney. Here’s a slightly different idea for using those left over tomatoes. Heat a large saucepan of boiling water until it is just starting to steam, then add enough tomatoes to fill the pan. Leave them in the boiling water until the skins start to crack. Take a blender, or masher and blend your tomatoes to a pulp. 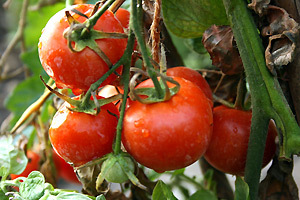 It’s worth passing them through a sieve to remove any unwanted skins or seeds which will keep the tomato mix nice and smooth. 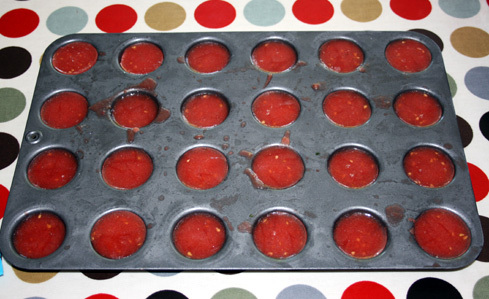 Next, allow the tomato to cool down, then, using a measuring jug pour the puree into either mini muffin trays or individual Yorkshire pudding trays. At this point you can flavor the sauce to your own taste, or leave it plain. I like to add a few leaves of basil, marjoram or oregano to give the puree a taste of the Mediterranean. 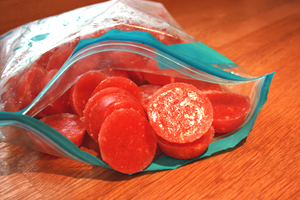 Put the tray in the freezer over night to set hard, then the next day take the tomato parcels out of the tray, bag them up and return them to the freezer. Each parcel is equivalent to roughly two whole tomatoes. The next time you need fresh tomato sauce for your chili, casseroles or pasta dish, simply dip into your freezer and add a few pieces to the pan! PS. I also freeze my soft leaved herbs like Lovage, Parsley and Marjoram in the same way. 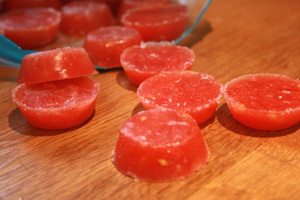 Whiz them up in a food processor, or chop them finely, then place them into a measuring jug and add some water. Then freeze in the same way as the tomatoes.